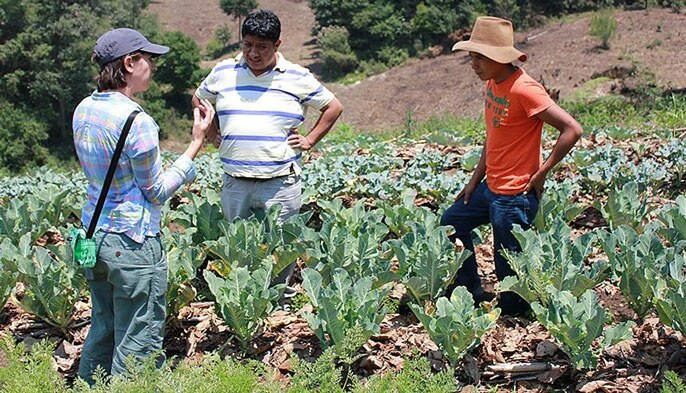 UC Davis leads an international team involved in connecting 9,000 rural households in Guatemala with climate-smart agriculture strategies and better water management, to promote food security and minimize poverty. The project MásRiego, which means more irrigation, aims to increase the incomes of farmers and their application of climate-smart strategies, such as rainwater harvesting, drip irrigation, mulch use, reduced tillage, and diverse crop rotation. The team will provide training to the farmers to help them to adopt the new techniques. They will also form partnerships to provide farmers with better access to microcredit financing and irrigation equipment. This new project is part of the U.S. government’s Feed the Future initiative. It represents an extra $3.4 million investment in the UC Davis-led Horticulture Innovation Lab by the U.S. Agency for International Development’s mission in Guatemala. The opportunity to impact so many farmers’ lives on this scale is exciting. We’re taking lessons learned from our previous research — in Guatemala, Honduras and Cambodia — and building a team to help more small-scale farmers apply our findings and successfully use these innovative practices. Collaborating with UC Davis is an international team with representatives from Centro de Paz Bárbara Ford in Guatemala; Universidad Rafael Landívar in Guatemala; the Panamerican Agricultural School, Zamorano, in Honduras; Kansas State University; and North Carolina Agricultural and Technical State University. The MásRiego project will focus on assisting farmers, especially women and youth, in growing high-value crops on plots of land measuring a minimum of 200 m2. Working with local agricultural schools and youth groups, the project team will provide students with a better understanding of water management practices and climate-resilient conservation for jobs in commercial agriculture and allied agricultural areas. Our local team is training youth as entrepreneurs, to see agriculture as an economic opportunity instead of just back-breaking work. They can envision a future in agriculture, with innovative ways to create value-added products or grow high-value crops for niche markets. Farmers in this region are likely to face additional competition for water as rainfall patterns fluctuate with climate change. Therefore, practices such as drip irrigation, rainwater harvesting, and conservation agriculture will be required more for small-scale farmers. Up to now, demonstration gardens have been constructed and members of a local youth cooperative have been trained in using water management, mulch, and taking care of a vegetable garden. The team are currently hiring local staff and starting a baseline survey to better analyze farmer needs, existing irrigation practices, existing vegetable production, and market demand. In an earlier research, the Horticulture Innovation Lab discovered that integrating drip irrigation with conservation agriculture techniques can effectively grow vegetables on small plots of land, without greatly compromising yield. These practices enhance soil structure, soil health, and moisture retention. Furthermore, women farmers who took part in the Horticulture Innovation Lab studies in Honduras, Cambodia, and Guatemala preferred using these practices for another significant reason: decreased labor with regard to vegetable bed preparation, controlling weeds, and manual watering. The foundation for the MásRiego project is built on the lessons and findings from the program’s Advancing Horticulture report about horticultural sector growth in Central America.